I’ve finally completed my painting of Loki the Shifter after starting it at an art demo back in July. Here is a link to my post about DRAWING LOKI. The final painting measures 12″ x 16″ and was painted in oil. 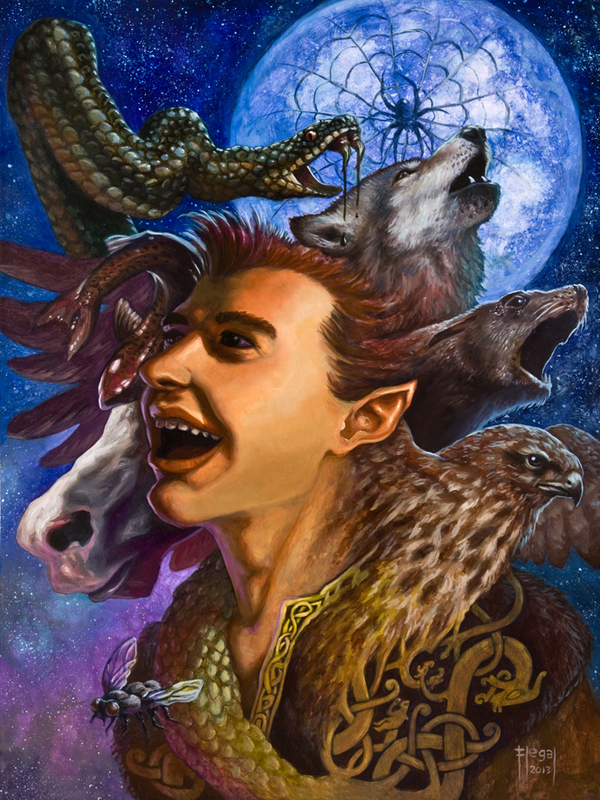 My goal for the painting was to show Loki merging with and swirling into all the various animals he is associated with both in the ancient myths and by modern pagans. Those animals include: horse, salmon, snake, spider, wolf, seal, falcon, and fly. The pattern on his shirt was taken from a norse stone. The pattern is thought by some to represent Loki entwined by two snakes. One thing I did differently with this painting is that I took a lot of progress photos. On Thursday I will post a detailed walk through of how I painted Loki the Shifter.